With gas price climbing, the Chevrolet Volt wonder car is the most in-demand car that General Motors sells, the automaker said today. That's partly because affluent customers want one of the $41,000 extended-range electric cars. And it's partly because there are so few to go around. With Volt on sale for three months, GM says it sold 982 Volts through Feb. 28. Sounds paltry so far as far as car sales go, but the numbers will grow as the year wears on. "Chevrolet is selling as many Volts as it can build, and the automaker expects to continue selling them as soon as they come off the assembly line. Some 10,000 cars are anticipated to be made this year with a ramp-up in production in subsequent years", GM said. 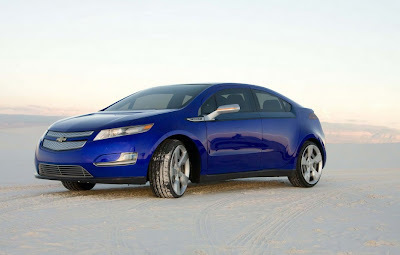 The Volt, North American Car of the Year, can be plugged-in to charge batteries good for 25 to 50 miles of driving. After that, a gas engine kicks in to recharge the batteries so the Volt has no electric-car range limitation.